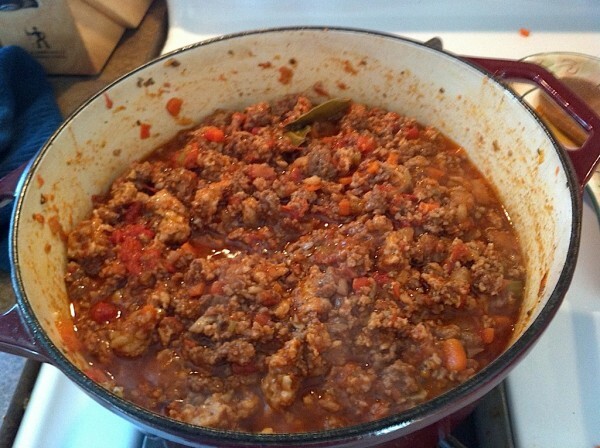 Here's my version of Chili that's been evolving for a couple of years now... finally came up with a combination of veggies and meat that the kids really enjoy eating! Simple as pie, I make it almost once a week - until we're sick of eating it, then I drop it out of the rotation for a couple of months. Optionally, you can add hot spices, jalapeño peppers, etc. spice it up the way you like it! Start off by cutting all the veggies into small cubes, put them into a heavy-bottomed pan with some oil... put some salt on them and begin to sweat them down a bit. Once they start getting a bit translucent, push them all to one side in the pan. Cut the baby bella mushrooms very fine (I use my slap chop) put a chunk of butter in the pan and then all the baby bella mushrooms. Cook the mushrooms down - we're looking to get them cooked, but we're really not looking for anything to brown, just start the cooking process. 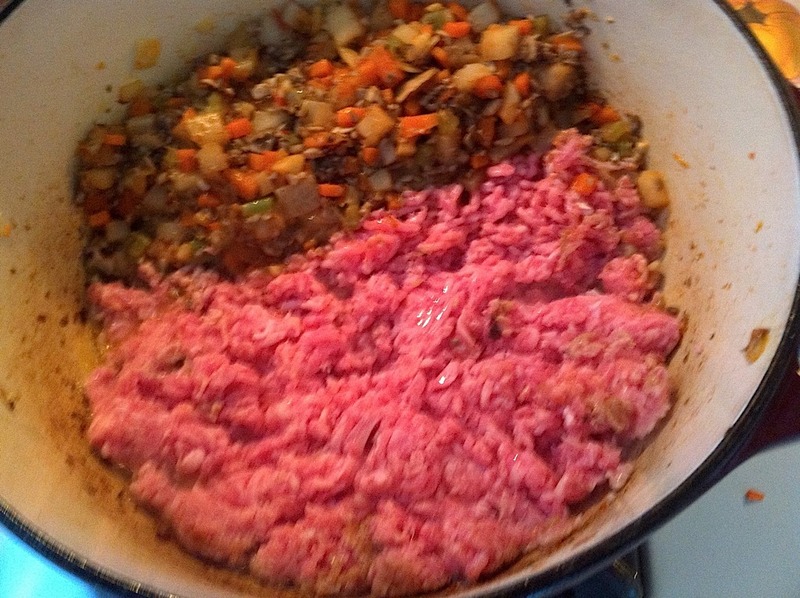 Once all the veggies have a nice start, I first add the ground veal. Again, I'm not really looking to "brown" the meat, rather I'm just looking to get it cooked mostly thru and then incorporate the cooked meat into the veggies and move it aside for the next meat. 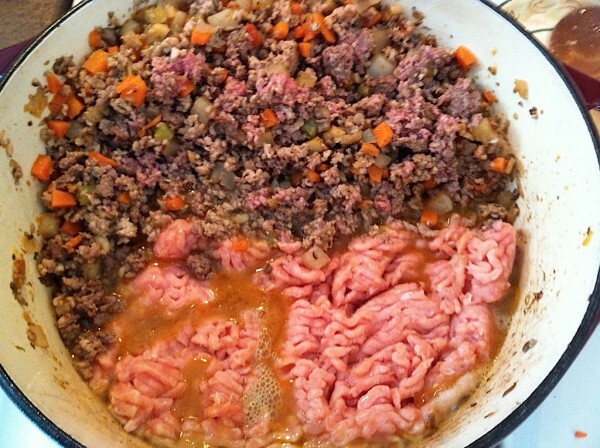 Once the veal is 90% cooked, I mix it together with the veggies, then push the whole lot to one side and add the ground beef. Here's the interesting part - I started using ground chicken a while back, and when I do, I let all the juices cook the chicken meat... so, this part, don't stir up the chicken too much otherwise, the chicken meat kinda dissolves and you don't get the nice chunks of chicken (trust me, it tastes GOOD). 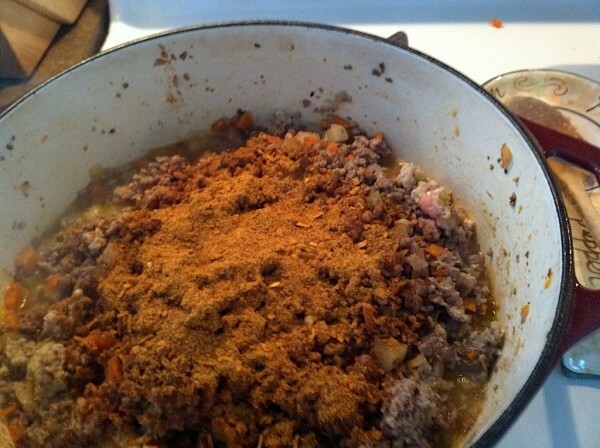 Now that you have all your ingredients cooked, it's time to mix it all together and add the taco seasoning. How much you use is entirely up to you and is based on your taste. If you like, you can use the packets of chili seasoning, you can put in your own mixture, whatever you like. I tend to make mine on the "non-spicy" side, because folks aren't really into spicy in my house (I add the spice to my own bowl). 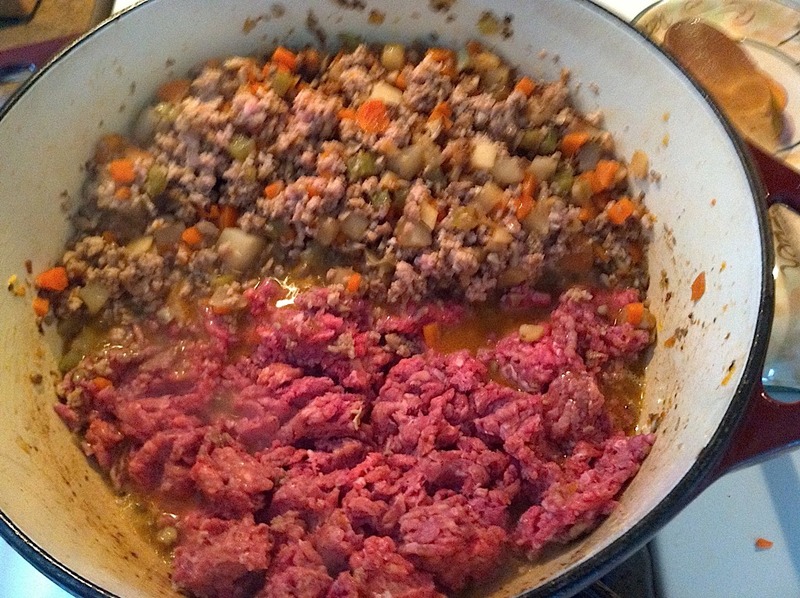 Last step, I add the two bay leaves (make sure to take them out, don't eat 'em). 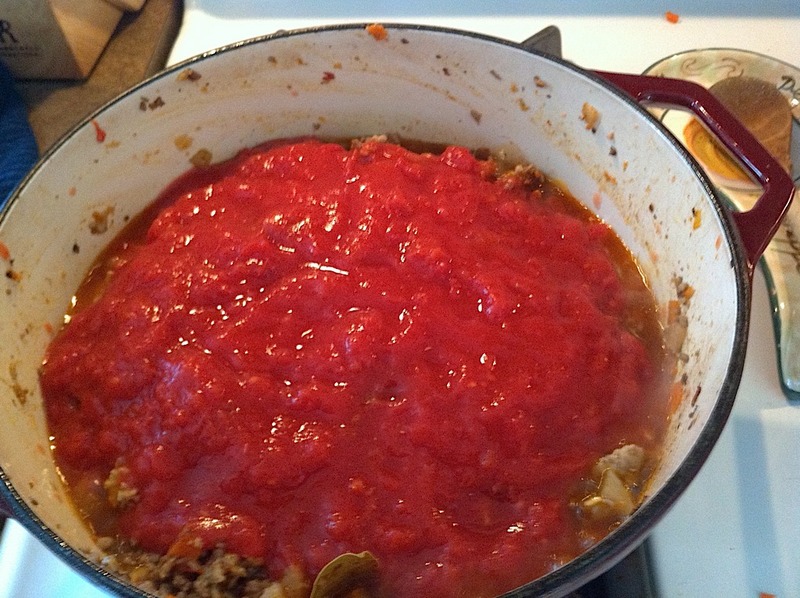 And the crushed tomatoes (or the whole tomatoes you crushed yourself). That's it - let it cook for a little bit to make sure all the meat is thoroughly cooked - and YOUR READY FOR SOME GOOD EATS! Let me know if you try it, and if you like it! I think adding the parsnips and the turnip give it a very unique flavor, almost like a hint of cinnamon. 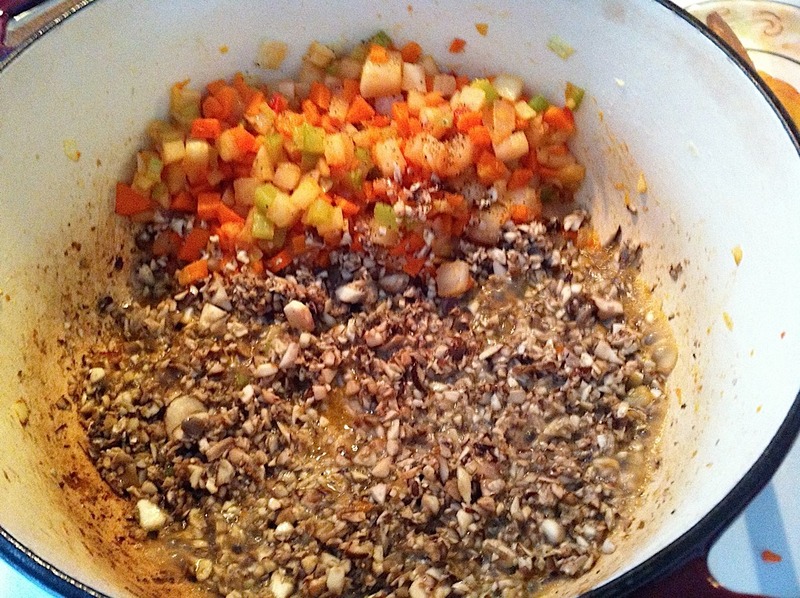 I pushed the veggies to one side, then put the mushrooms in and cook. Again, looking to cook the meat thru before incorporating the rest of the veggie/veal mixture. As you can see, starting to get some nice juices! Let the juices cook the chicken, resist mashing it up! Use crushed or whole that you crush yourself.